The emblem of the UDC is a cotton boll superimposed on a five-pointed star with one word of the motto inside each of the five points. The R. Don McLeod Chapter 2469 was organized on September 12, 1982 by 20 charter members. The Chapter voted unanimously to name the chapter after R. Don McLeod who settled in Crawfordville in 1897. 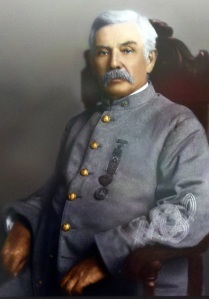 R. Don McLeod sustained the Confederate tradition by serving after the War in numerous UCV camps and organized the George W. Scott Camp No. 1557 and in facilitating numerous Confederate pensions. Judge McLeod served in Wakulla County in both his public and personal capacity to initiate observance of all UCV Special Days. Memorial Day was always observed by his camp marching the one mile to honor their departed comrades and by placing the Confederate flag on their graves. The Wakulla County Historical Society hosts the R. Don McLeod room including a handsome portrait of Judge McLeod and the Chapter's original charter. Other wonderful articles include the Judge's ribbon collection from his attendance at UCV reunions and conferences. As the old saying goes, behind every good man is a good woman. In the case of the legacy of the R. Don McLeod Chapter, we proudly recognize Judge McLeod's daughter, Martha McLeod. Among her many initiates, Martha wrote "McLeod Heritage and Ancestry" which included her family's Confederate legacy. She pioneering the Chapter's scholarship fund in honor of her father. We now have funds sufficient to sponsor two Chapter scholarships. Martha's artifacts, including period furniture, clothing, china, and books are included in the R. Don McLeod room. To learn more about the Wakulla Historical Society, please contact our Historian. To read an excerpt of Martha's work, click here. July 2010, we lost a distinguished Daughter and icon of our community. 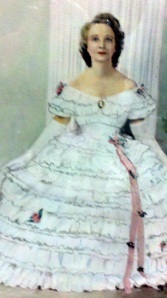 Mrs. Celia Revell Whaley served our Chapter for many years in many capacities including Historian and Treasurer. Mrs. Celia was also Monument Chair regarding the placement of the Confederate monument in Jewel Hudson Park. Our Chapter will honored Mrs. Celia in a graveside dedication where a UDC grave marker was placed. Mrs. Celia and other deceased members are included in our Find a Grave Memorial. (April 2015) Myrtle Roddenberry Langston was born 103 years ago in Sopchoppy, FL to Methodist parents, the late Susie and Stephen Roddenberry. Standing a towering 4’10” (5’3” with her beehive hairdo) she recalled a youth full of her favorite passions including dancing, playing the piano by ear and thumbing through the Sears Roebuck catalog for the latest fashions. She married her high school sweetheart, Amos Langston at the age of 21. She held interesting jobs during her lifetime including working as a welder on military ships – a true “Rosie the Riveter”. She played the church organ at Sopchoppy First Baptist Church for more years than one can count. To her grandchildren she was best known for playing “Hold that Tiger” on the piano, her mouth-watering friend chicken and serving both biscuits and cornbread at every meal. She taught them never to play cards or go fishing on Sunday. To her neighbors she was best known for mowing her five acre lawn while holding a parasol and wearing a 16”-lb paper sack over her hair to protect her hair. She transplanted more than 5,000 daylilies and drove her automobile around Sopchoppy until she just over 100 years old. Mrs. Myrtle was the granddaughter of James Alfred Revell, 3rd Florida Infantry. Laveda Roberts Raker passed on to Heaven's Chapter on Thursday, August 21, 2014. Laveda was born on December 22, 1929 to John and Delma Raker Roberts in Sanborn, FL. She was a lifetime resident of this area and a long-time member of Sopchoppy Southern Baptist Church and a former Chapter President of R. Don McLeod 2469. Laveda graduated from Sopchoppy High School on May 23, 1947, as Salutatorian of her class and was a star basketball player. 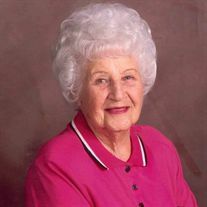 She entered the workforce at the Florida State Welfare Board in September 1947. From there she went to work in the Social Security Administration. Thereafter she worked for several years for Ford Motor Company as an Accountant. Mrs. Laveda graduated from Tallahassee Community College with high honors on the Dean's List. After graduation she was employed with the Florida Supreme Court as an Accountant where she handled the accounts for Florida's 5 District Courts of Appeal and all Circuit Courts in the State. She retired from the Supreme Court on January 31, 1992. She is survived by her husband of 13 years, Silas Overton Raker; one son: Capt. Joe Hodge (LeAnn), Pensacola, FL; three daughters: Valerie Hodge Lewis (Ron), Susan Hodge Parsons (Greg), and Kelly Hodge Thomas (David) all of Tallahassee; two brothers: Richard Randolph Roberts and Eddie Earl Roberts; three sisters: Elizabeth Roberts Smith, Callie Roberts Quigg and June Roberts Seymour (all members of our Chapter), 9 grandchildren and 1 great grandchild. Leave a tribute at Mrs. Laveda's Find a Grave Memorial.